Analog Input Ground—These terminals are the bias current return point for AI DIFF measurements. All ground references—AI GND, AO GND and D GND—are connected on the device. Though AI GND, AO GND, and D GND are connected on the device, they are connected by small traces to reduce crosstalk between subsystems. Each ground has a slight difference in potential. Analog Input Channels—For differential measurements, AI+ and AI- are the positive and negative inputs of a differential analog input channel. Analog Output Ground—AO GND is the reference for AO. All ground references—AI GND, AO GND, and D GND—are connected on the device. Though AI GND, AO GND, and D GND are connected on the device, they are connected by small traces to reduce crosstalk between subsystems. Each ground has a slight difference in potential. 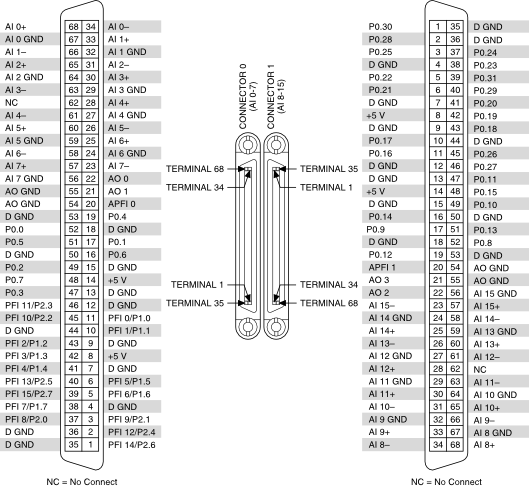 Digital Ground—D GND supplies the reference for port 0, port 1, port 2 digital channels, PFI, and +5 V. All ground reference—AI GND, AO GND, D GND—are connected on the device, they are connected by small traces to reduce crosstalk between subsystems. Each ground has a slight difference in potential. Analog Programmable Function Interface Channels—Each APFI signal can be used as AO external reference inputs for AO, or as an analog trigger input. APFI are referenced to AI GND when they are used as analog trigger inputs. APFI are referenced to AO GND when they are used as AO external offset or reference inputs.